Walton County, Florida stretches from the Alabama border on the north to the Gulf of Mexico on the south. South Walton County is known for some of the most beautiful beaches in the world. Florida Scenic Highway 30A is the rural road that hugs the coastline down here and goes through sixteen unique communities along its 28.5 mile length from Inlet Beach on the east to Dune Allen on the west. Two of the most fantastic Florida state parks are also along this route: Topsail Hill Preserve and Grayton Beach State Park. This stretch of coast is between Panama City Beach and Destin, both well known Florida tourist destinations. 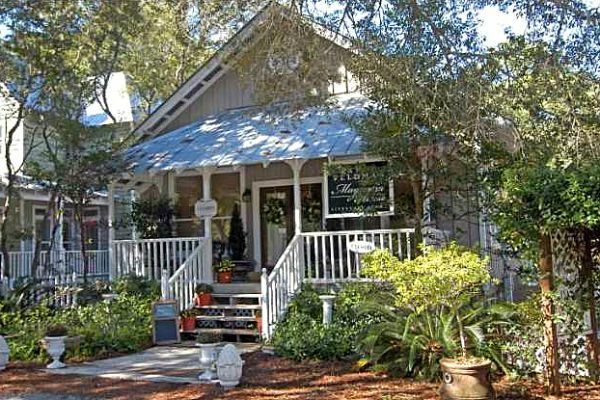 Many of the communities along 30A are relatively new planned developments that provide their own self sustaining lifestyles with shopping, restaurants and other service enterprises that make them little towns with their own identities. 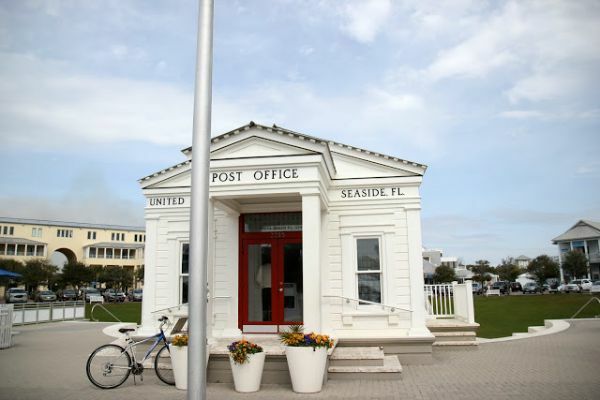 Seaside, for example, was developed in 1981 and is an example of walkable town planning that has been emulated elsewhere in the country. Rosemary Beach is another new town founded in 1995 on land that was originally part of the old Inlet Beach community. Grayton Beach, on the other hand, is a genuine old Florida beach town that has been welcoming tourists for generations. This town has been the traditional weekend and vacation spot for folks in Alabama, Mississippi and George for generations. 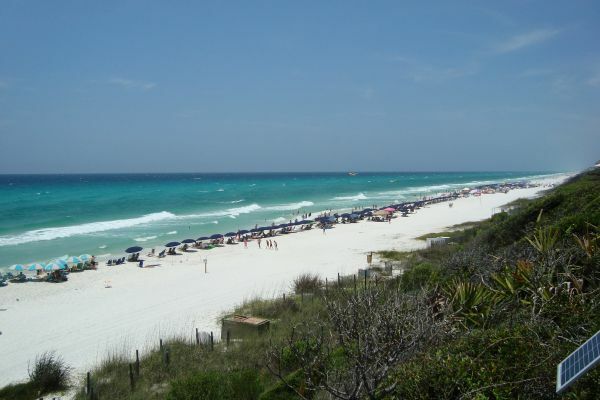 Grayton Beach is in the heart of what is sometimes called the "Redneck Riviera". Tourist seasons are different up here than in the more southern regions of Florida. The peak season is from Memorial Day weekend through Labor Day weekend. Most beaches, restaurants and lodging have their biggest crowds during this stretch of the year. I personally like October and November because the crowds are gone, the weather is still pretty good and most restaurants remain open and are not so crowded. Grayton Beach looks more Old Florida than most of its more modern neighbors. It's just about in the middle of the route, and has a lot of weathered old beachy homes and cottages that remind you of a bygone era when it was the only settlement along what was then a lonely coast. 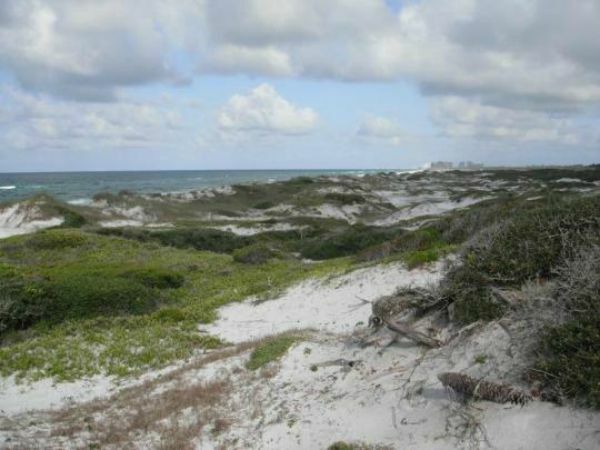 The community is surrounded by Grayton Beach State Park whose white sands were once listed by "Dr. Beach" as the most beautiful beach in America. The land along this stretch of beach was first homesteaded in 1885 by former Army Major Charles T. Gray. The town of Grayton Beach was founded in 1890 when Army Generals William Miller and William Wilson came to the area. They named the town for Major Gray. The town remained remote and hard to visit until the 1930s when US Highway 98 was completed as the major route between Pensacola and Panama City. Grayton Beach has also survived a few hurricanes. Opal in 1995 caused a lot of flooding and damage from Gulf waters which topped over the tall dunes. The only original home in the community is called "Wash-A-Way". It is was originally built in the 1890s by Captain Gray and is now a thoroughly modernized bed and breakfast inn. It's at the end of County Road 283 right on the gulf and got its name when the unnamed hurricane of 1926 washed away its foundation. Seasonal and short term rentals are available all along this coast, but most of them are fairly pricey. More budget minded travelers can look into the camping and cabin accomodations at the two State Parks, but reservations should be made well in advance. 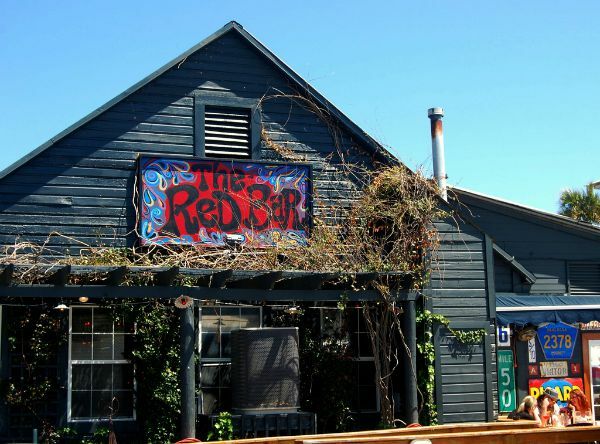 Red Bar is a tradition in Grayton Beach. It is very popular with tourists and locals alike. It is in a weathered old building in downtown Grayton Beach that used to be a general store. 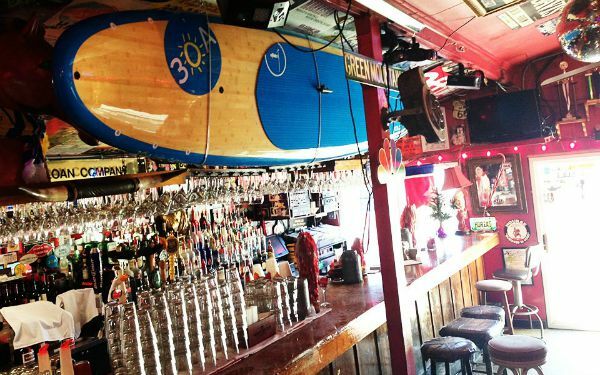 It has a laid back beachy atmosphere. Parking is sometimes hard to find right next to the restaurant, and sometimes you will have to wait longer than you'd like for a table. But the wait will be worth it and when you are in Grayton Beach you should really try it. Most nights you will be entertained by live jazz music. If you are a people watcher, you will enjoy watching the crowded bar. This is not a place you go if you want quiet conversation and candlelight. It is a busy happening place almost all the time. Many people come in right off the beach, so the ambience is always casual and light hearted. Don't be shocked to see a bikini now and then. Some people come just to enjoy the bar, snacks and music. The drink menu is extensive and has the full range of alcohol from scotch to beer and wine. They are well known on this coast for their Mojitos. 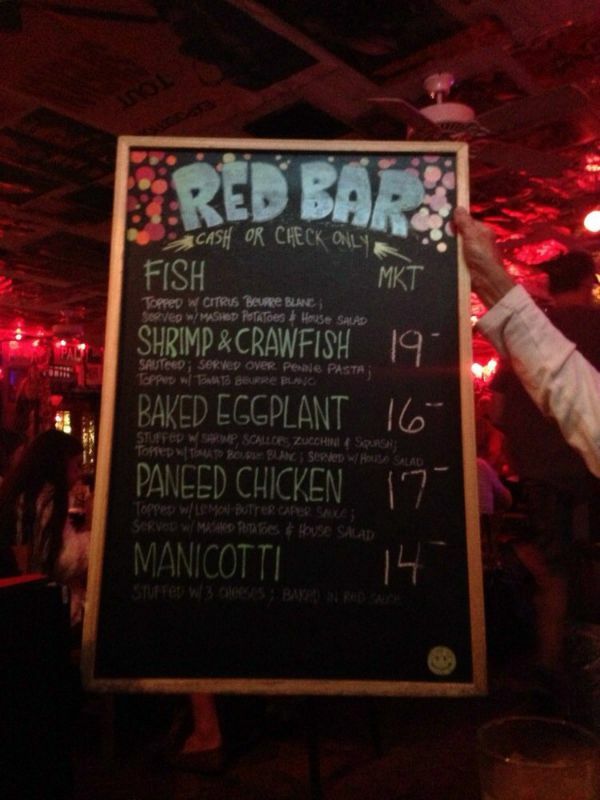 The menu at Red Bar is short but the food is tasty. The staff doesn't hand you a menu; your server will stand at your table with a blackboard that pretty much sums up what is available. They are well known for their crab cakes and mahi-mahi, but you can get pizza and other pasta dishes if you like. Their salads are great too. Try their blackened grouper or crawfish or shrimp. Landlubbers will like the panne chicken with mashed potatoes. Or you might enjoy the spinach and grits if it is available. For dessert, try the bread pudding or the key lime pie. Red Bar is open 7 days a week from 11am to 10pm.